Powerful database design and modeling tool. Cross-platform data comparison and synchronization. Generate realistic database test data. Powerful database design and modeling tool. 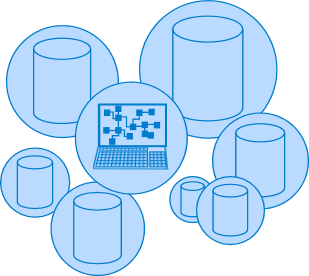 Visualize database structures, create databases or reverse-engineer databases to modify, document and optimize. Generate realistic and meaningful test data for database testing purposes. Generate data for Oracle, MS SQL, MS Access, PostgreSQL and MySQL databases. Compare and synchronize database data. The tool helps you compare and deploy changes quickly. Compare MySQL, Oracle, MS SQL, PostgreSQL and MS Access databases. Compare and synchronize database schemas. Datanamic SchemaDiff will give you the full picture of all database schema differences. Repository database for collaborative modeling. The Datanamic Repository is a central repository database to store your data models designed with DeZign for Databases. Execute multiple scripts against multiple databases. Fast parallel execution of multiple SQL scripts with support for Oracle, MS SQL, MySQL and PostgreSQL. And see why tens of thousands of database developers worldwide choose Datanamic. Customers across a wide scope of industries use Datanamic tools in a variety of ways to simplify and accelerate their database development, management and administration. "I have been using DeZign for Databases for years now - and find that it offers features found in products many times its price. Excellent value." "I'd like to express my satisfaction with your tool DeZign for Databases. I've been using it for some time, it is a great help in my work, and I find it to be the best." Tips and how-to guides for Datanamic products.